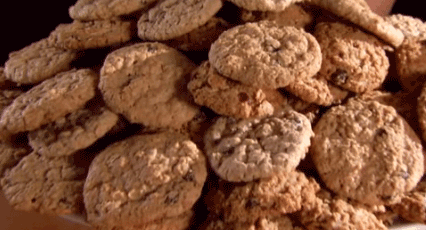 You’ll never believe these cookies are gluten-free! These do not last long, and even my most finicky eaters came back for more of these gluten-free oatmeal cookies. You'll never believe these cookies are gluten-free! These don't last long. Even my pickiest eaters came back for more of these gluten-free oatmeal cookies. minutes. Cool the oats for 2 to 3 minutes on the pan. Grind 2 ½ cups of toasted oats in a food processor until they have the consistency of whole wheat flour, about 3 minutes. Add the baking powder, cinnamon, and salt to the food processor and pulse 2 to 3 times to combine. Set aside. Combine the butter and sugars in the bowl of a stand mixer and mix on medium speed using the paddle attachment until light in color, about 3 minutes. Stop once to scrape down the sides of the bowl. Reduce the mixer to the lowest speed and add the egg and vanilla extract. Mix to combine. Slowly add the flour mixture until just combined. Stop once to scrape down the sides of the bowl. Add the remaining toasted oats and the raisins. Stir to combine. Scoop the dough with a 1 ½ ounce disher onto parchment lined half sheet pans, leaving 2 inches between each mound. Bake until the cookies begin to brown around the edges, 12 to 14 minutes. Rotate the pan halfway through baking. Cool on the pans for 2 minutes, and then move to a cooling rack to cool completely.